On March 4, 1865 Abraham Lincoln made his way to the United States Capitol to be sworn in for his second term of office. No American election had ever been held under wartime conditions and it was testament to the will of the country and president that it happened. 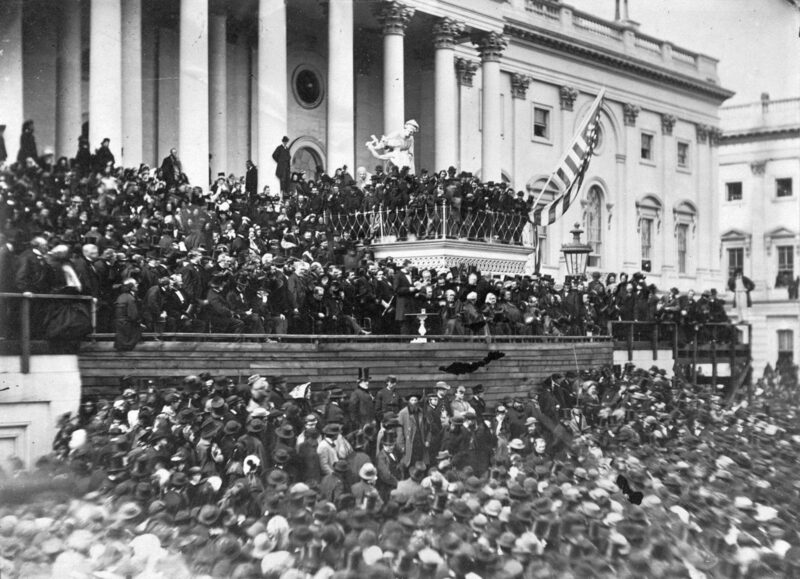 Lincoln’s platform was under the newly completed dome-a project he had urged be finished despite the fighting. It was the symbol of the nation he sought so hard to re-unite. March 4, 1865 was a cold rainy and windy day, but by noon, the sun broke through, flooding the stand with brilliant light. Before taking the oath, as custom, Lincoln rose and gave his address. He had 40 days left in his life. Of all the speeches he gave during his lifetime none was so meaningful for him to utter. 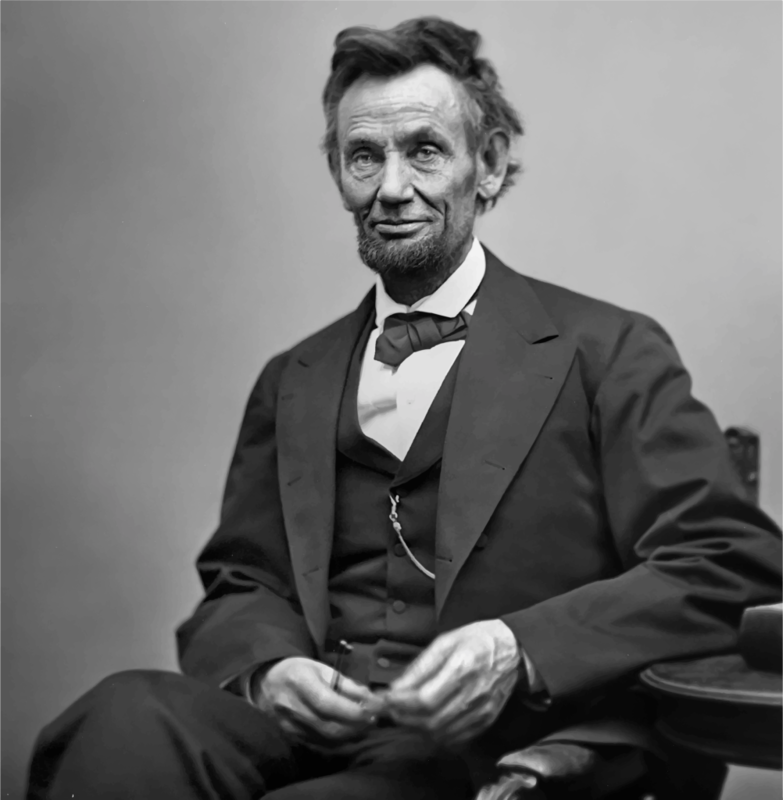 The war was coming to an end and Lincoln knew that his speech could lay the groundwork for the “unfinished work which they who fought here have thus far so nobly advanced.”That “unfinished work” was the elimination of slavery from the nation. Lincoln knew it would occupy his second term as he would begin the job of healing the nation, getting the country back together after four long years of war and forging a new future. 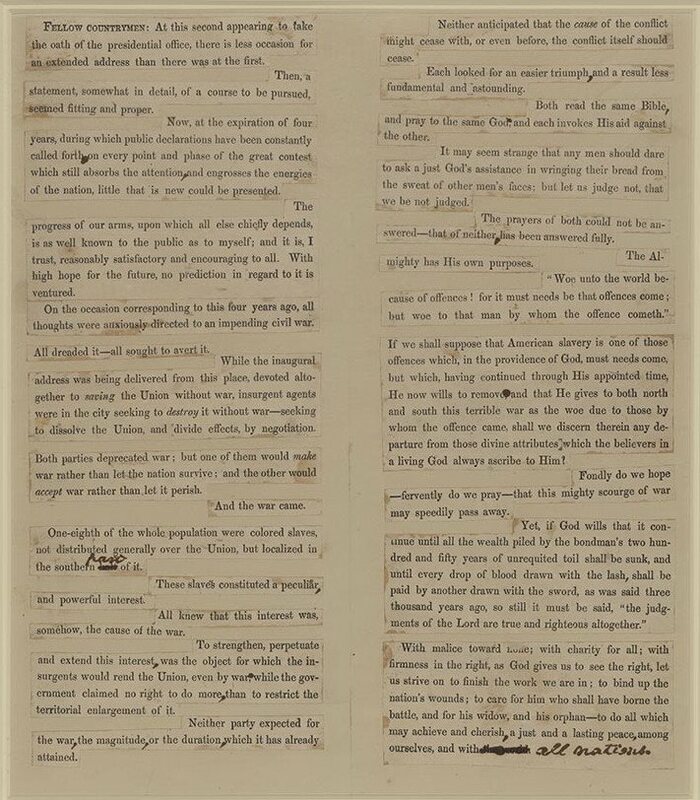 Lincoln’s rhetorical skills reached their culmination in the Second Inaugural and stands as the continuation of the Gettysburg Address. Lincoln had come a long way in his formal addresses. He had surprised audiences with his House Divided speech and his Cooper Institute speech. The pressure of the wartime presidency sharpened his ability to think and write clearly. 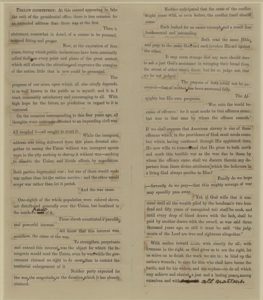 Lincoln’s Gettysburg Address, a speech with simple but resonant words placed in complex structures and sentences, achieves its purposes by its internal form as well as its more explicit content. Author Gary Wills believes that a combined study of the Gettysburg and the Second Inaugural speeches gives a true picture of Lincoln’s beliefs about his country and slavery. In the Second Inaugural, slavery becomes a sin. God requires the entire country to pay for the sin of slavery by shedding blood during the Civil War. Wills states in his book “Lincoln at Gettysburg-The Words That Remade America,” the Second Inaugural complements and completes the Gettysburg address and is the only one that stands with it. It is interesting to note that at the famous memorial in Washington, the seated Lincoln is flanked by those two speeches. I urge a reading of Wills’ book and his wonderful description and analysis of the speech that goes hand-in-hand with the Gettysburg Address. Lincoln’s address on that cold March day consisted of 703 words and was the second shortest inaugural address. Five hundred and five words are one syllable. Lincoln mentions God fourteen times, quotes Scripture four times, and invokes prayer four times. Lincoln used the word “war” or its pronoun nine times. The centrality of war is magnified because the word is prominent. Previously war had been used as the direct object, both historically and grammatically, of the principal actors. In his speech, however, war became the subject rather than the object. The second paragraph concludes, “And the war came.” In this brief, understated phrase, Lincoln acknowledged that the war came in spite of the best intentions of the political leaders of the land. When Lincoln introduced the Bible, early in the third paragraph, he entered new territory in presidential inaugural addresses. 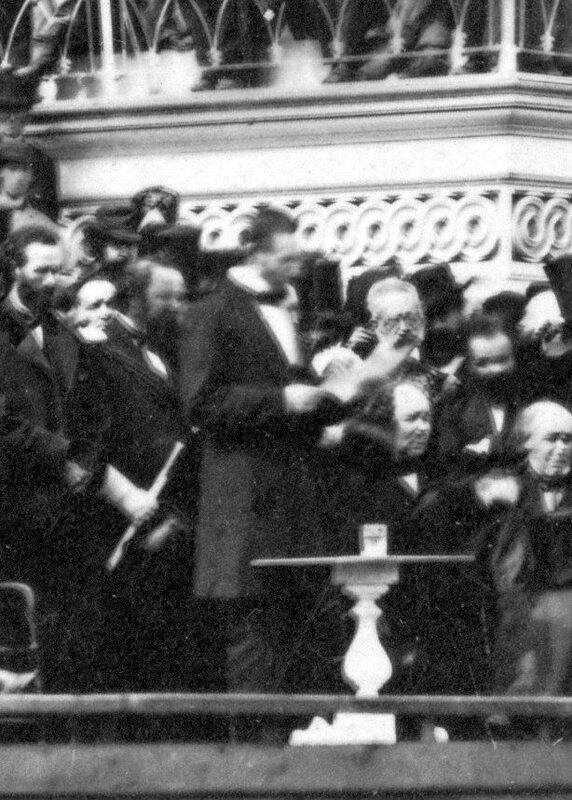 Before Lincoln there were eighteen inaugural addresses delivered by fourteen presidents. Each referred to God or the deity. The Bible, however, had been quoted only once. Later in the address Lincoln uttered a blistering biblical quotation: “Woe unto the world because of offences” (Matthew 18:7). When he defines American slavery as one of those offenses, he widened the historical and emotional range of his address. Lincoln did not say “Southern slavery” but asserted that North and South must together own the offense-that both were responsible for the original sin, that being the sin of 250 years of slavery. Having to repay that debt as Lincoln puts it, the toil shall be sunk-an accounting term. Lincoln carried the scales of justice to his speech. He did so knowing that Americans had always been uncomfortable facing up to their own malevolence. Lincoln suggested that the war was a means of purging the nation of its sin of slavery. The images reach their pinnacle in “until every drop of blood drawn with the lash, shall be paid by another drawn with the sword.” His words sound more like the romantic language of Julia Ward Howe’s “Battle Hymn of the Republic” (“As He died to make men holy, let us die to make men free”) than the legal language of the lawyer who delivered the first inaugural address. The first eight words of Lincoln’s last paragraph proclaim an enduring promise of reconciliation: “With malice toward none, with charity for all.” These words immediately became the most memorable ones of the second inaugural address. After his assassination they came to represent Lincoln’s legacy to the nation. Lincoln ended the address with a coda of healing: “to bind up, to care for, to do all which may achieve and cherish a just, and a lasting peace.” In this concluding paragraph he offered the final surprise. Instead of rallying his followers, in the name of God, to support the war, he asked his listeners, quietly, to emulate the ways of God. Let us remember his great words. Basler, Roy S., et al., eds. The Collected Works of Abraham Lincoln. 8 vols. New Brunswick, N.J.: Rutgers University Press, 1953. Also index vol., 1955, and supplements, 1974 and 1990. White, Ronald C., Jr. Lincoln’s Greatest Speech: The Second Inaugural. New York: Simon and Schuster, 2002. Wills, Gary. Lincoln at Gettysburg: The Words That Remade America: New York: Simon and Schuster, 1992. This entry was posted on Sunday, March 3rd, 2019 at 10:45 pm	and is filed under Bugle Stories, History of Taps, News. You can follow any responses to this entry through the RSS 2.0 feed. You can leave a response, or trackback from your own site.